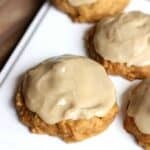 Soft and cake-like pumpkin cookies topped with a delicious caramel frosting. With an electric mixer, beat together sugar and oil. Add egg, milk, canned pumpkin and vanilla and blend well. In a separate bowl, mix together the dry ingredients. Add the dry ingredients to the wet ingredients and mix, just until incorporated. Drop batter by spoonfuls onto a greased cookie sheet. Bake at 375 degrees F for 10-12 minutes. Allow to cool before frosting. In a medium saucepan, combine the butter, cream, brown sugar and salt, and cook over medium heat, stirring constantly, until the mixture comes to a boil. Spread the frosting over the cooled cookies.